An article just published in the journal “Nature” shows a research based on the detections carried out by NASA’s Cassini space probe. Among other information provided by the mission there’s also evidence that on Enceladus, one of Saturn’s moons, there are signs of the presence of hydrothermal vents. This means that there are waters heated by geothermal energy similar to those existing on Earth, where the presence of various microorganisms abounds, particularly those known as extremophiles. Hydrothermal activity occurs when the sea water infiltrates and reacts with a rocky crust emerging as water hot and rich in minerals. 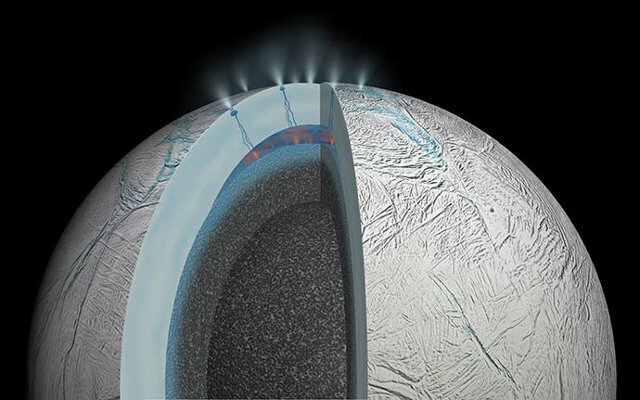 This normally happens in the seas of the Earth and it’s known for some time that there’s an underground ocean on Enceladus in which water is in its liquid state. The Cassini space probe also documented the presence of geysers that emit water, other minerals and even organic molecules. Exactly the study of the geyser emissions performed using the data collected by the Cassini space probe, which analyzed some samples, surprised the researchers showing the characteristics of hydrothermal activity. The CDA (Cosmic Dust Analyzer) is the Cassini’s instrument that repeatedly found tiny silicon-rich rocky particles. Along with their size, ranging between 2 and 8 nanometers, those are characteristics that are typical of the particles on Earth produced in hydrothermal sources. The researchers analyzed data collected by the Cassini space probe for four years to check other possible origins of those particles and rule them out. Computer simulations and laboratory experiments led to the conclusion that those tiny particles were almost certainly produced by hydrothermal activity. That occurs when hot water containing dissolved minerals from inside coming from the rocky inside of the moon travel outwards and come into contact with colder water. According to this research, the water must be salted and slightly alkaline, with a pH greater than 8.5. The most interesting element is that the water must come in contact with hot rocks, at least 90° Celsius (194° Fahrenheit). It’s a very high temperature for that kind of environment that still has no explanation but that the temperature is assessed after many checks were carried out. The very small size of the particles suggests that they traveled upwards relatively quickly. From the bottom of the sea to the outer space, the distance of about 50 km (about 30 miles) was covered in a time of no more than a few years, otherwise they would be larger. The existence of hydrothermal vents was a possibility also proposed in another article recently published in the journal “Geophysical Research Letters”. That kind of activity was identified as a possible source of methane in the plumes of gas and ice particles erupting from the south polar region of Enceladus. This theory explains the abundance of methane in these plumes. That’s because at the high pressures that one would expect to find in this moon’s ocean there might be icy materials called clathrates. Those are compounds in which guest molecules are trapped within other host molecules. On Enceladus, the clathrates could trap the methane molecules in a crystal structure of ice water. The methane could be produced by hydrothermal processes as well. It’s not the only explanation but the presence of silicon-rich particles favors this theory. In the end, this is circumstantial evidence and not of direct observations but they made many efforts to rule out other possibilities and independent research point to the possibility of existence of hydrothermal vents. For some time scientists have been wondering if on Enceladus life forms might exist. The existence of an environment similar to life-rich ecosystems on Earth is certainly promising. That might not be enough but the possibility is extraordinarily intriguing.